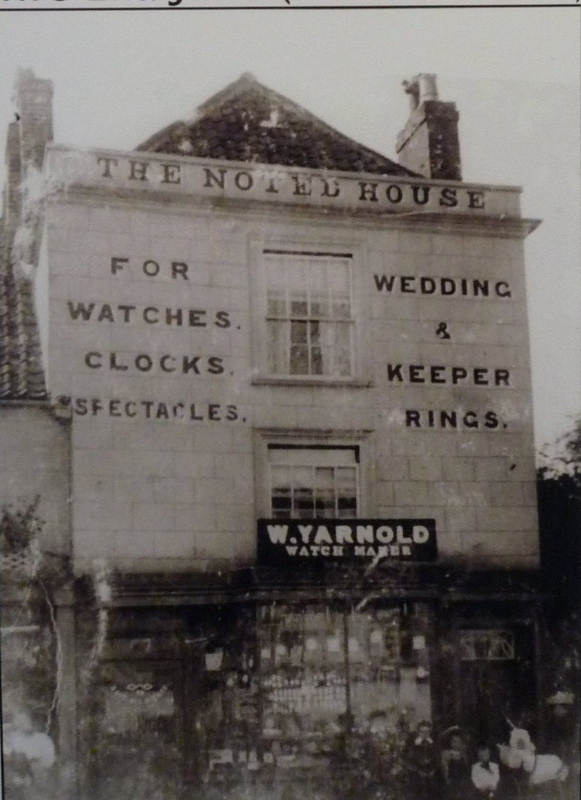 The photograph above shows 16 High Street when it was called ‘The Noted House’ a watch and clock shop owned by William Yarnold. We have been unable to trace any old deeds of this property so have had to rely on census records, rate books and electoral records etc to build up a brief history of the property. Our earliest record is the 1840 Tithe Survey in which the property was listed as Plot 62, a house and garden owned and occupied by Thomas Osborne Wetmore. Thomas’s main home was at Park House. We suspect he acquired 16 High Street so that he could divided the garden at the rear of that property and incorporate part of it into his own garden at Park House. He let 16 High Street out to tenants. Following Thomas’s death in 1868, his property was put up for sale. This property was simply described as ‘Lot 6 – all that freehold residence situate and being in the High Street, Thornbury and lately let at a rental of £18 per annum, but at present vacant‘. We are not sure who occupied the property prior to 1859 when it was occupied by Samuel Smith. Mary Ann Lewis – the 1861 census shows the property was occupied by Mary Ann Lewis, a clergyman’s widow aged 75 and born in Breconshire. She was living there with three of her grandchildren. The 1862 Rate Book shows the ‘Revd. Lewis’ was living there, but we think that this was a mistake unless it referred to one of her sons, two of whom became clergymen. Mary Ann had been married to the Reverend Thomas Lewis, an Anglican cleric born in Carmarthen in 1780. He graduated from Wadham College, Oxford in 1804, married Mary Ann Thomas in Breconshire in 1805 and they had eight children. Thomas’s first posting was at Woolaston, Gloucs (1804-1813), then briefly at Rushbury, Shropshire, before returning to his homeland in 1815 as rector of Merthyr and perpetual curate of Llangynog and Llanstephan (all Carms) until his death in 1842. In addition to having two sons who were clergymen, two of their daughters married clergymen, including one, Clara Eleanor, who married John Field who was a schoolmaster at the Thornbury Grammar School in late 1850s and 1860’s. This may have led Mary Ann to come to live in Thornbury. Mary Ann died in Almondsbury in 1867. The Wesleyan Ministers – for several years the property became the home of the various Wesleyan ministers. The Chapel was then located in Chapel Street in the building now used as The Cossham Hall. The 1871 census notes that Elisha Middle Shearn, a Wesleyan Minister, was living there. He was aged 33 from Bath living with his wife, Elsie Ellen aged 27 from Poole and their children: Herbert Frank aged 3 , Eleanor aged 2, both born in Castle Cary, and Gertrude Lillie born on 11th October 1869 in Thornbury and baptised in the Wesleyan Chapel on 18th March 1870. We know from the Bristol Mercury that Elisha was on a rota involving him once every six weeks being the minster of the church at Kingswood. By 1872 Elisha had moved to become a minister in Banwell. The 1876 Rate Book notes that Revd George Robinson was the tenant of W. H. Councell. The 1877 and 1878 Gas Rate Books list Revd Thomas Howson as the occupant, although his name is crossed through indicating that he had moved elsewhere. In 1880 the Revd Peter Prescott was there. In the 1881 census Peter was aged 59 and born in Gateshead. He was living there with his wife, Hannah M aged 25 from Kempley in Gloucestershire. In 1885 at the time that William Yarnold bought the house on 14th August the property was occupied by Revd. T. Kirby at £19.00 a year for £375. The 1885 Rate Book notes that Mrs R. W. Kirby was there. The Yarnolds – on August 14th 1885 the Bristol Mercury had an article which said that William Yarnold bought a premises in the High Street which was occupied by the Rev. T. Kirby at £19.00 a year for £375. William didn’t move in immediately. The 1887 Rate Book shows that William Vowles is a tenant of the house and yard. By 1890 Rate Book William Yarnold was listed as the owner and occupier. In 1958 the property was put up for sale. It was described as having four floors and a large cellar. On the ground floor was the shop, cloakroom with W.C., a dining room/bedroom, kitchen and scullery. On the first floor there was a lounge, kitchen/dining room, bathroom, bedroom and long passage. There were two more bedrooms on the second floor and two attics on the third floor. Since 1965 the property has been used by various estate agents, initially King Miles, then Alder King, Black Horse Agencies and later Chappell and Matthews.